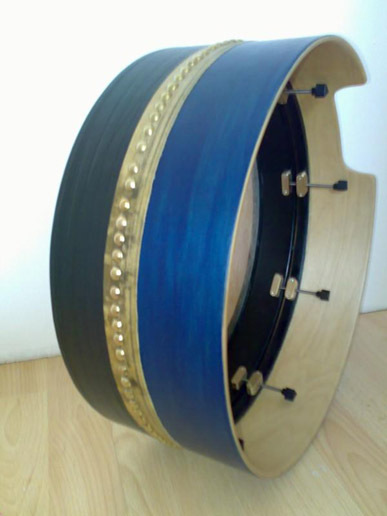 The standard model, available in 16 inch, 15 inch and 14 inch diameters, with a standard depth of 6 inches. Other depths from 4-7.5 inches are available, at no extra cost. 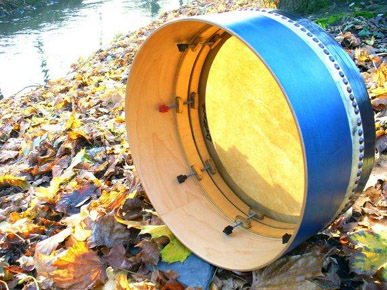 This is constructed with a laminated maple rim, and a laminated birch plywood tone-ring. 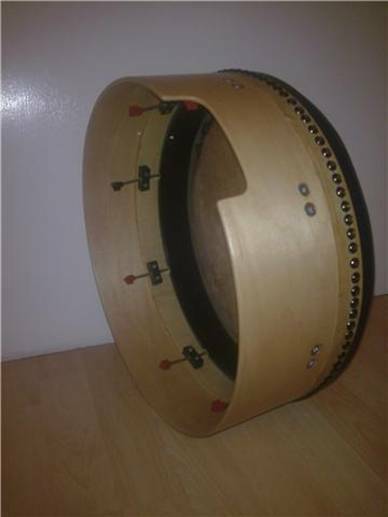 The drum is tuneable using a Philips No. 2 screwdriver, and offers excellent tone and quality at a very reasonable price. It is available stained any colour of your choice and finished in clear varnish, the tonering can also be stained the colour of your choice, and varnished or sprayed black. 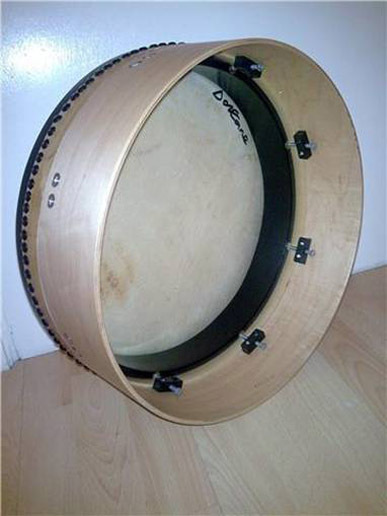 It is available with a thin, medium, or thick Lambeg goatskin. Cut outs are available at no extra cost, a single bar inside is also available, if desired, for free. 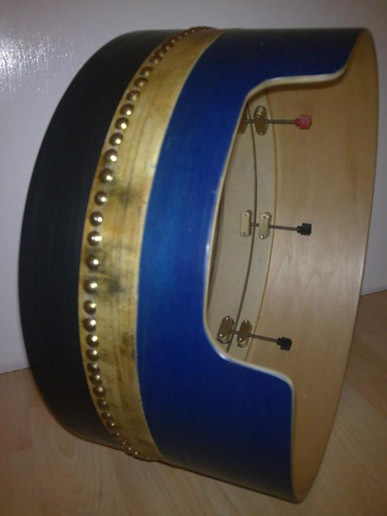 Style A Bodhrán with cut-out and bar. 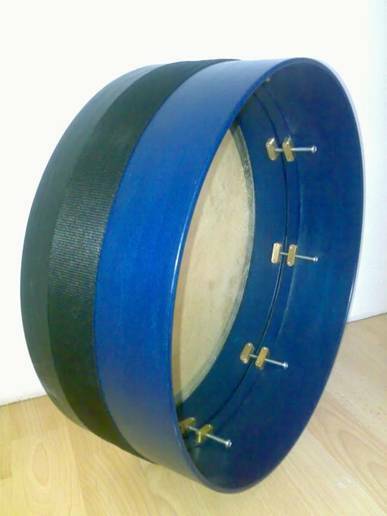 The next model, available in 16 inch, 15 inch and 14 inch diameters, with a standard depth of 6 inches. Other depths from 4-7.5 inches available, at no extra cost. 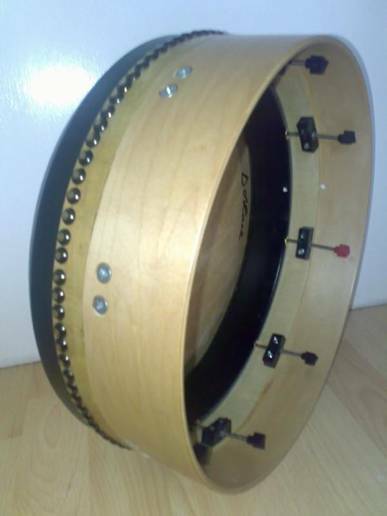 This is also constructed with a laminated maple rim, and a laminated birch plywood tone-ring. 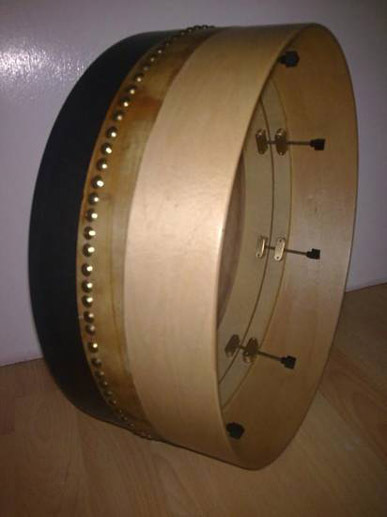 The drum is tuneable using tuning knobs designed by Darius Bartlett and Rob Forkner. This speeds up tuning, as no screwdriver is required. This has excellent tone and quality at a very reasonable price. It is available stained any colour of your choice and finished, in clear varnish, the tone-ring can also be stained the colour of your choice, and varnished or sprayed black. 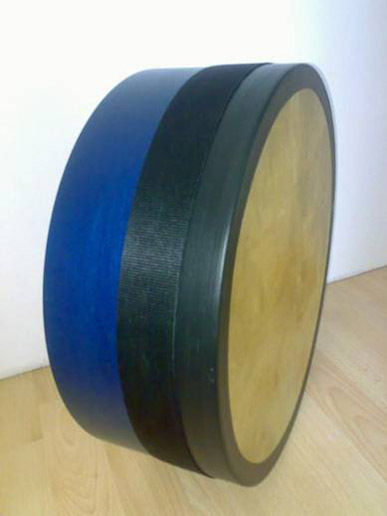 It is available with a thin, medium or thick Lambeg goatskin. Cut outs are available at no extra cost, a single bar inside is also available, if desired, for free. 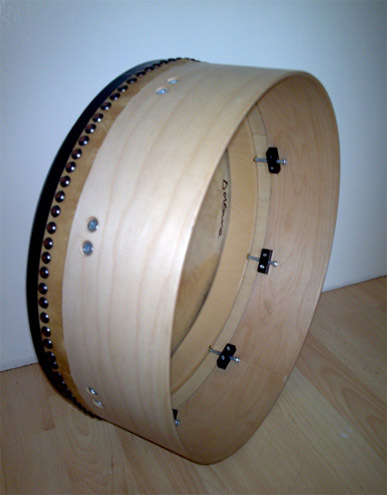 Style C bodhráns are constructed from maple and birch plywood. They have an integral tone-ring, a larger playable surface area, and increased bass. Hand tapped brass blocks are used to provide extra durability. 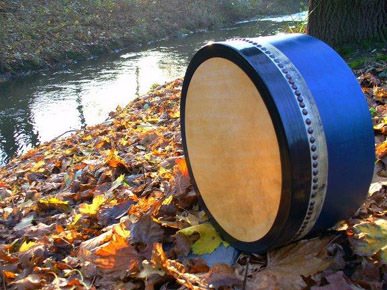 This drum has excellent resonance and sustain. 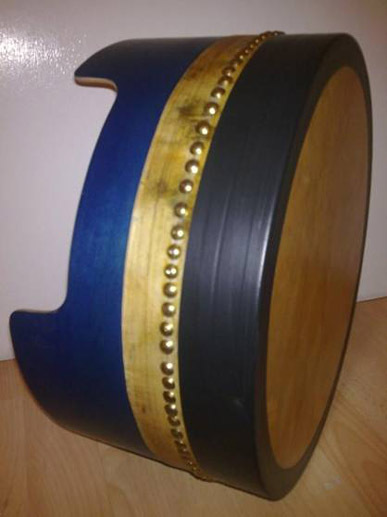 The thinner rim and larger playing surface combined, create a very loud and powerful sounding drum. It has a refined, minimal appearance. 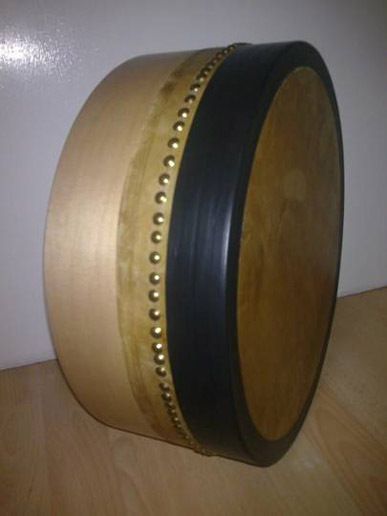 This model is also available with a thin, medium, or thick Lambeg goatskin. A cut-out or bar are also available at no extra cost. It can also be stained the colour of your choice. A Philips No. 2 screwdriver is used to tighten and loosen the skin. These are currently my top of the line bodhráns. They are constructed from maple and birch plywood. They have an integral tone-ring, a larger playable surface area, and increased bass. Hand tapped brass blocks are used to provide extra durability. 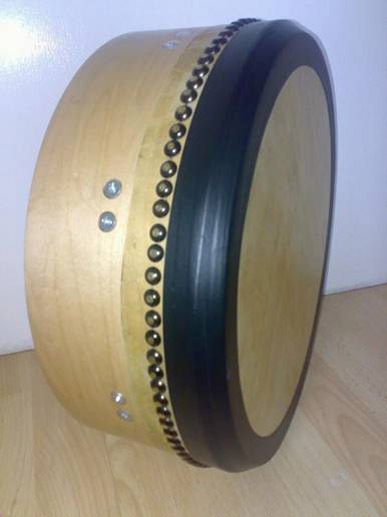 The drum is tuneable using tuning knobs designed by Darius Bartlett and Rob Forkner. 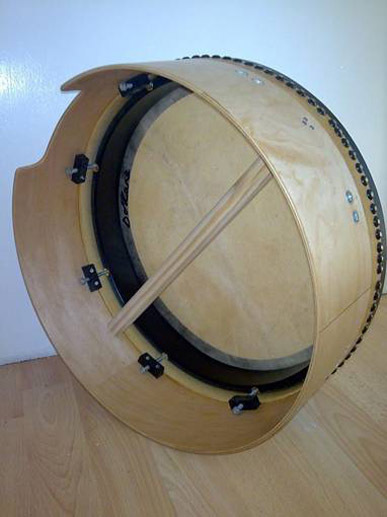 This drum has excellent resonance and sustain. The thinner rim and larger playing surface combined, create a very loud and powerful sounding drum. 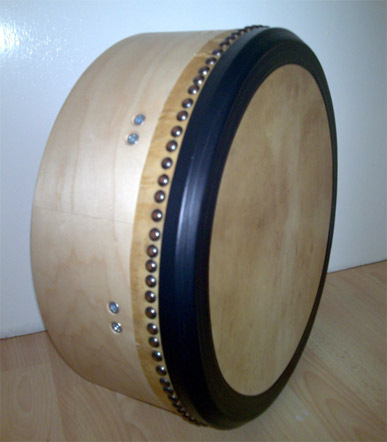 This model is also available with a thin, medium, or thick Lambeg goatskin. A cut-out or bar are also available, and it can also be stained the colour of your choice, at no extra cost.